The depraved and the immoral claim the moral high ground. These criminals actively and illegally conspired to steal the 2016 election. In a just world, Obama and his quisling admin would be indicted for treason. The whole motley crew. Samantha Power, former U.S. ambassador to the United Nations, has unmasked an “unprecedented” number of top intel folk during her final year with the Barack Obama administration. Criminal abuse of power. These top Obama Dems “weaponized” classified intelligence information against President Trump. No one is being held accountable, and Congress has done no oversight. If you recall, during the presidential election, I ran a number of stories on the breach of Obama’s passport at the Department of State. Brennan was the CEO of TAC – and also a consultant to the 2008 Obama campaign – when his company was accused of breaching the passport files of Obama prompting an investigation by the State Department (more here). You will also recall that the key witness in the presidential passport tampering case was murdered — shot in the head, in his car, in front of his church. The case remains unsolved. Brennan is a thug who threatened Trump after the election. There’s something rather remarkable about watching/reading expressions of political violence from key democrat ideologues atop the Marxist left-wing of the party. Every time we see this reaction, I immediately try to reconnect with those who I’ve previously forewarned but were not yet at a place where they could accept. As disturbing as these unhinged expressions might be, there are benefits…. their alliance gets smaller. John Brennan was a career CIA official who voted for the communist party in 1980. He was also a 2008 Obama adviser when he was caught hacking into State Department passport records. After the 2012 Benghazi attack, Brennan was moved into the position of CIA Director to cover and tamp-down any issues that might arise (he made everyone sign NDA’s). As CIA Director Brennan was also caught hacking Senate computers to monitor the Senate Intelligence Committee. He apologized. 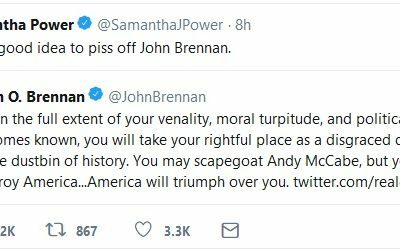 Perhaps more disturbing was Samantha Power’s response. Samantha Power is the wife of Obama’s initial regulatory Czar Cass Sunstein. After spending Obama’s first term as a foreign policy adviser, and key architect behind collapsing the nation of Libya (R2P), President Obama rewarded Power with the post of U.N. Ambassador. Throughout election year 2016 Samantha Power, via her State Department office, was unmasking names from the DOJ/FBI conspiracy team’s FISA(702) searches, and FISA(Title-1) surveillance results. After discovery, she claimed in 2017 someone else was using her database access. Brennan and Power represent the Chicago-Marxist/Weather-Underground/Saul Alinksy/ radically violent and activist left… These are the apex predators who are cocktail party hypocrites and architects of: Revolution Communism (RevCom), Occupy Wall Street, Black Lives Matter, Dream Defenders and AntiFA.